Im putting this dismal year behind me and planning for a busy and prosperous 2009. Wall Street hates uncertainty. That’s a phrase we hear every four years, and this time I really hope it’s true. By the time you read this, the 2008 presidential election will be decided (hanging chads notwithstanding) and we should be on our way to financial stability, if not prosperity. I hope. With rose-colored bifocals in place, I’m bidding an early and not-so-fond farewell to 2008, and I’m welcoming 2009 as if it were already here. Whoever the next president is, the financial markets here and elsewhere in the world will know that little dust storm has settled. There’s absolutely no doubt the economy will be Job One for whomever the next leader is. So I’m already looking ahead to the business (and busyness) of the new year. We have several year-ending projects that need your help. And there a couple of recession-be-damned investments I’d like to tell you about. First is our web site. We just completed a major redesign of www.FoodProcessing.com, and the results are stunning. Not only is the look more attractive, but we have reorganized content – both our own and that from other sources – in more logical and usable ways. And it comes with a new year’s resolution to step up the flow of new content to the site. So give it a visit and come back often. There’s a lot of deep research on our site, starting with our own annual research projects: Top 100(c) companies list, Manufacturing Trends Survey, R&D Survey, Salary Survey, Capital Spending Report, Readers’ Choice Awards. We also carry research from outside sources and have a library of more than 115 white papers, on everything from Brix measurement to the scale-up of rotor/stator equipment. Right about in the middle of our home page is a block directing you to our Research Resource Center. The Top 100 is one of those things that doesn’t get the respect it deserves. 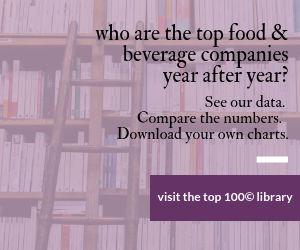 What you saw in the August magazine – the two-page table ranking U.S. and Canadian food processors by sales – was only the tip of this iceberg. Only a web site could house all the additional material we collect: company location information, key executives, subsidiaries and divisions, food and beverage product areas and brand names – yes brands. That’s in the Research Resource Center box on the home page, as well, or go direct to www.FoodProcessing.com/Top100. There’s a lot more to the new site, but I will let Erin Erickson, our digital editor, tell you about it all beginning with her column and over the coming two months. Speaking of research, any day now you should be receiving an e-mail from me asking your help with the annual Manufacturing Trends Survey. That January cover story always is revelatory, but it should he particularly interesting as a gauge of food company confidence going into the new year. And at the risk of abusing you, in the first few days of December we start another research project, our annual Readers’ Choice Awards. We hope you’ll take a few minutes to recognize those suppliers of equipment and ingredients who make your job easier ... and we hope you read the story in our March issue to find out who would be good replacements for suppliers who are not performing as you would like. That’s our optimistic and busy start to 2009. I hope your plans for the new year are similarly upbeat.